Would you like to jazz up your galleries with some custom CSS? The CSS Addon for Envira Gallery is a great addon if you want to be able to make small design changes on a per-gallery basis. We’ll walk you through how to use the Envira’s CSS Addon. I’m new to writing CSS, how can I get started? Why isn’t my CSS change showing? Is this the only way to add CSS? In this instance, you’ll be activating the Envira CSS Addon. Next, navigate to the Misc tab. Here you will find the Custom Gallery CSS field below the Enable RTL Support feature. This will add 40 pixels of space both above and below the gallery. The possibilities for customization are endless, and this makes it easy to contain your styles to specific galleries. Check out some of our other styling docs to continue using custom CSS to change your gallery look and feel. Each of our styling tutorials will provide direct links to examples. Q: I’m new to writing CSS, how can I get started? A: You might find this tutorial helpful to get started using CSS to customize the appearance of your gallery. Q: Why isn’t my CSS change showing? 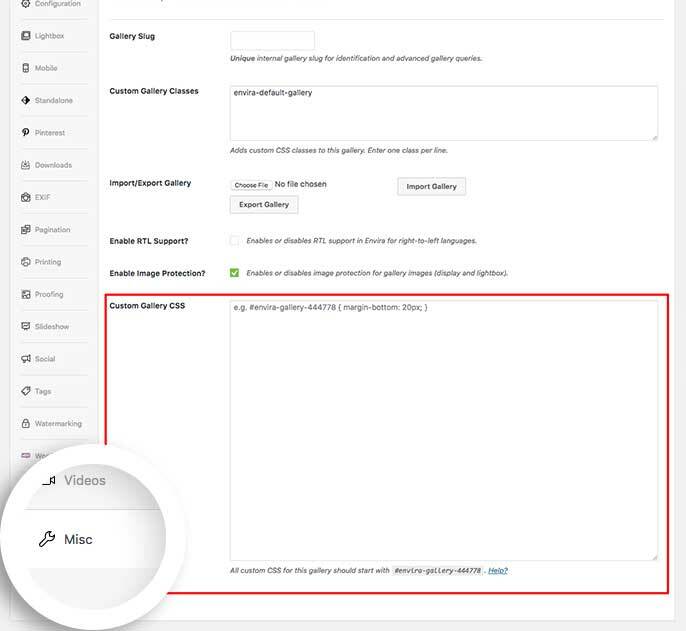 A: Check that you’ve added your CSS to the Custom Gallery CSS field and not the Custom Gallery Classes field (shown below). Q: Is this the only way to add CSS? A: Not at all! Whether you want to change your galleries or anything else in your theme, you can use the WordPress Customizer to add Additional CSS. Check out our guide on How to add custom CSS to the WordPress Customizer. A: Absolutely! On the Misc tab of an Envira Album, you’ll see the same options to add your CSS. Fix: Custom CSS box should now longer strip out anything after the quotes on HTML characters. Added: CSS Support for Albums Addon. Fixed bug with HTML entity encoding for quotes in CSS. Fixed bug using wrong hook for setting.